The star of this picture is the plate of potatoes at the food-stop table. They were awesome. That was one hard ride on Memorial Day. But no time to wallow in my soreness. Another tough one is coming up this Saturday. 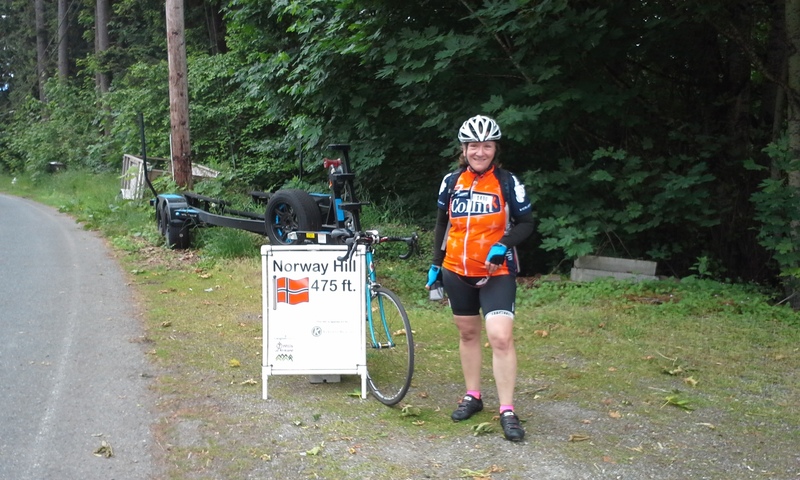 I signed up for these two back-to-back, backbreaking bike rides — the 7 Hills of Kirkland and the Flying Wheels Summer Century — because I wanted to do both. Unfortunately, every year, they are close together, and this year they’re within the same week. Me after climbing Norway Hill, hill No. 4. 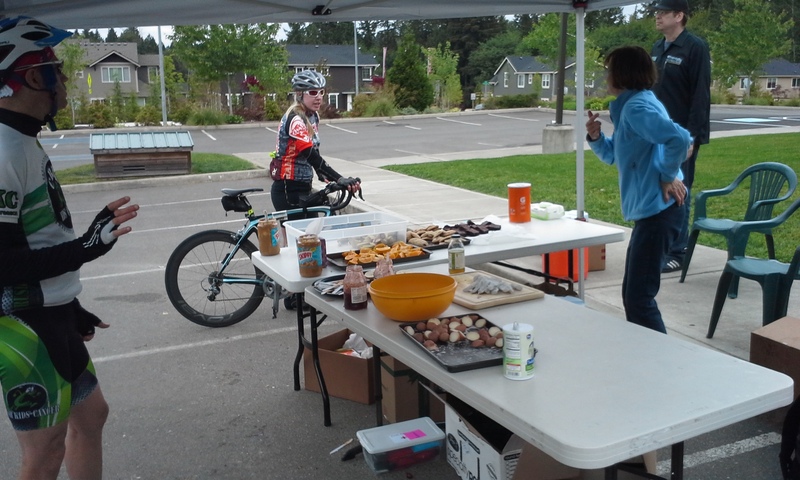 The EvergreenHealth 7 Hills of Kirkland is an increasingly popular Memorial Day ride that celebrates the hills on its course. It’s a benefit ride for Attain Housing, with proceeds going to provide housing and services for the homeless. The main and 100K courses run through Juanita, Bothell, Kenmore, Woodinville, Redmond, Bellevue, and start and finish in Kirkland’s Marina Park. The main ride is about 40 miles — this is the version I’ve done twice previously, in 2012 and 2014. There are also Metric Century (100K) and Century (100 mile) routes, and this year I opted for the 100K for something different. They call the route I did 100K, which should be 62 miles, but it actually measured 58.2 miles on the course map. It still took me more than six hours to finish, due to the hills. This is Robin, who climbed Norway Hill with me. I have no regrets, but I had no energy left after the ride, either. You do the seven hills on the main course — Market, Juanita, Seminary, Norway, Kingsgate, Winery and Rose — plus three others (Education twice and Novelty) in the 20-mile added loop in the 100K. It’s already a tough ride, but the added loop includes the endless Novelty Hill, which you wonder if you will ever see the top. Let me say here that I cannot imagine doing the 7 Hills Century Ride. In it, you tackle the previously mentioned 10 hills, plus three others, and endure a long, challenging ride through the Snoqualmie Valley and Snohomish County. The 100K turned out to be long enough and hard enough for me. 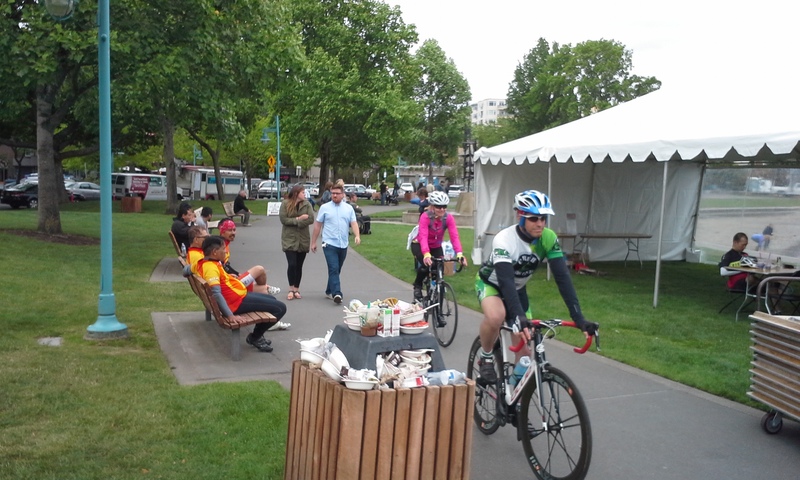 Riders at the finish line at Marina Park. 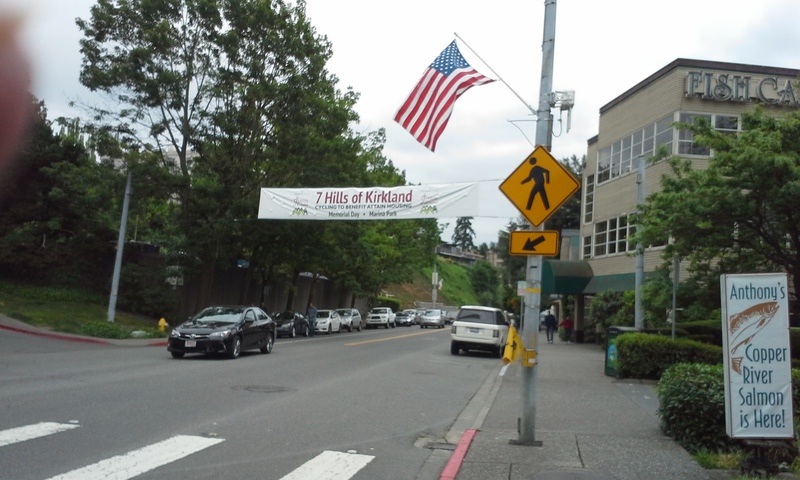 I wrote about these first seven hills in my 2012 post, which the 7 Hills of Kirkland website continues to feature on the bottom of its home page. I described each hill, and I don’t feel any different about any of them. Rose Hill has the highest elevation (525 feet) and the longest incline (three miles), but Winery Hill (390 feet) is the steepest and hardest of the main seven. But Novelty Hill (470 feet and 2.7 miles long) has to rank as the most demoralizing. You’re riding eastward, away from everything, with no clue as to when the hill will end and if you’ll ever be turning around. 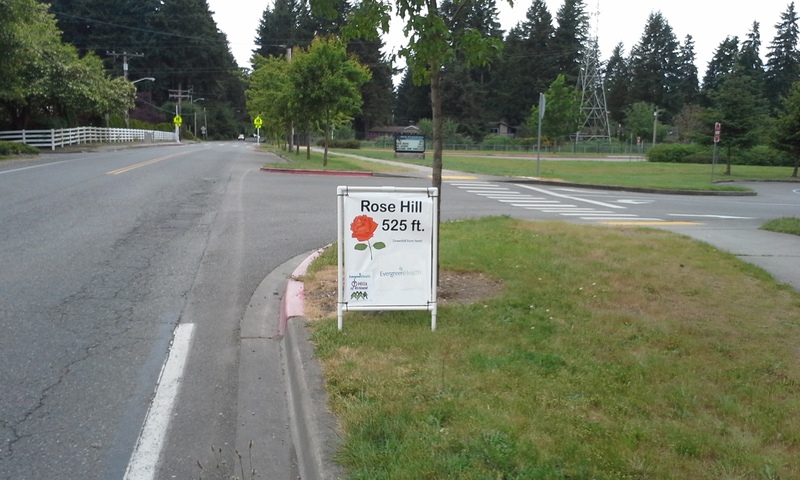 I’ve done this hill once before, in the last Seattle Century ride in 2012, but don’t remember it being so challenging. This sign was great to see. Got to the top of the last hill! I’m happy to say that I rode up all of these hills, but had to weave back and forth to get up Winery Hill. That is very unsafe to do; fortunately, there was only one car that passed by as I was laboring to climb the hill. Oh, but I will rebound and be ready for Saturday’s Flying Wheels Summer Century — my only century planned for this year. It will be my longest day of the year on a bike. Also, my fifth century overall and 20th organized ride since I started doing them in 2011. Nice to ride past this sign in downtown Kirkland to the finish line. But first, must tell you about the potatoes featured at the last 7 Hills of Kirkland food stop on Education Hill in Redmond. Yummy! See top photo. Never had small potatoes and a dash of salt like that. Hit the spot better than brownies or chocolate chip cookies. Nice idea! Thanks for reading! Till next time, when I’ll be really sore. 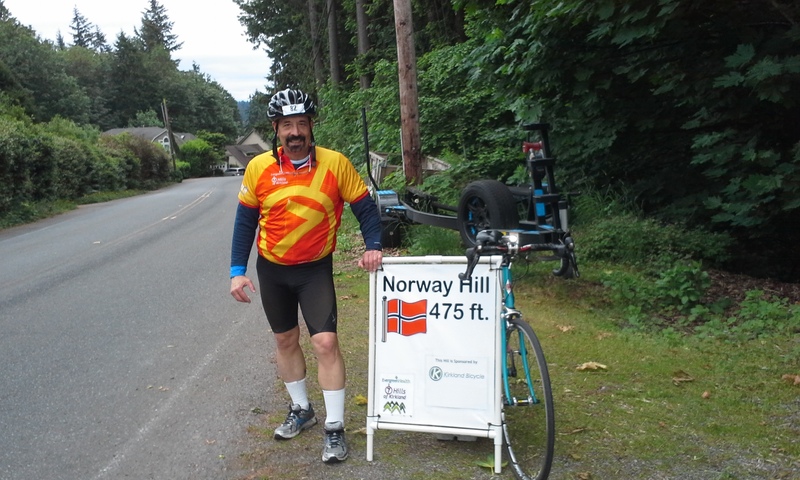 This entry was posted in 7 Hills of Kirkland, Bicycling, Century, Flying Wheels, Seattle Century and tagged 7 Hills of Kirkland, Bicycling, Flying Wheels, Seattle Century. Bookmark the permalink.